Honda’s NSX has taken on near mythical status, but does the reality live up to the hype, or would you be better off sticking with a Porsche 911 or Audi R8? Sadly, we suspect the vast majority of NSXs will end up lying dormant under dust covers as inflation-proof investments. That’s nothing short of a criminal act in our eyes, because along with all the technical wizardry and phenomenal performance on offer, the NSX is one of the most engaging and usable everyday supercars you can buy. It’s as comfortable, quiet and as easy to drive and park as your mum’s Civic, but inhale deeply and crank the drive mode selector to Sport+, and the combination of 545bhp and four-wheel-drive traction hurls you at the horizon at insane rates, and fires you through bends quicker than a fibre optic pulse. Do we like it? Just a bit. Interested in buying a Honda NSX? 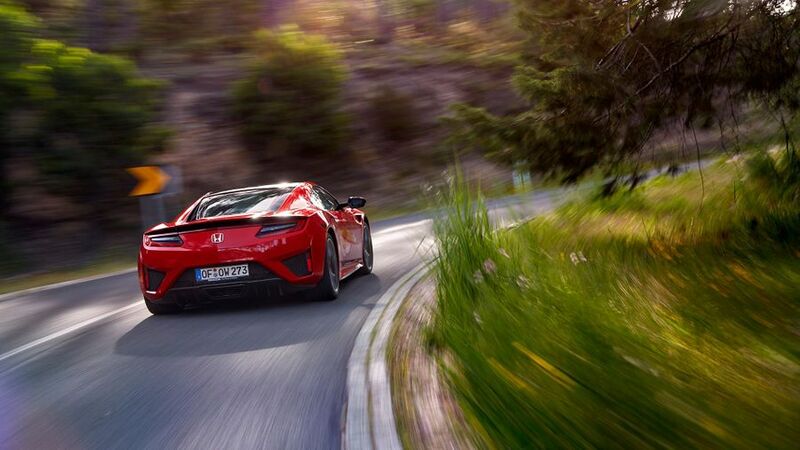 The old adage, ‘a picture is worth a thousand words’ probably says all you need to know about the way the NSX looks. It’s a stunning car, which owes as much to the demands of aerodynamics as it does to any designer’s imagination. The combination of those myriad slashes, ductings, wings, and a very low body is a winning one. In common with many supercars, the NSX’s cabin is pretty snug. Although we’re not talking Ford GT40 levels of restriction, head-room is an issue. Tall people will get perilously close to the roof lining, and those sweeping windscreen pillars will cut into their peripheral vision. 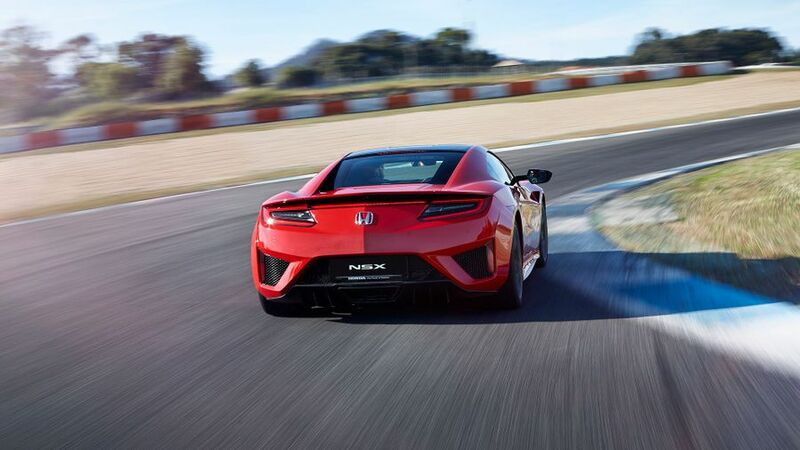 We’d suggest anyone over 6ft tall should – at the very least – sit in an NSX before ordering. However, rear visibility is better than you’d expect from a supercar, and the NSX is relatively easy to park and drive in narrow streets. Well, compared to other supercars anyway. Although interior quality and design are solid, we would have expected Honda to adopt a more bespoke approach for the NSX. Too many components – including the frustratingly slow and fiddly touch-screen – look and feel like they have been lifted from run-of-the-mill Hondas. While some of the touch-point plastics look, and feel hard, at least the sports seats are comfortable and supportive, while the squared off steering wheel and shift paddles deliver superb feedback. The NSX delivers all the space and versatility of a Ford Galaxy MPV. Ok, so we might have made that bit up. But if you’re buying a supercar, you’re probably not going to stop to consider practicalities. Although Honda claims the boot is the biggest in class, that’s not saying a lot. You will squeeze a soft overnight holdall and a laptop bag in the back, but if you’re planning a golf weekend away, you’ll definitely need to hire your clubs at your destination. The NSX is so comfortable and stable under normal driving circumstances, it’s not until you find a stretch of engaging Tarmac that the hairs on your arms really start to stand on end. It’s so controllable, so planted and so supple, and it changes direction with such tenacity. The feeling of being at one with the car is even more impressive when you consider the amount of electronic processes taking place to make it all work. Even when flying through torturous twisties and mercilessly punishing the car to its limits, you’ll struggle to sense any notable steering corruption as the power shuffles around all four wheels. If you’re driving in a more sedate manner, the NSX’s optional carbon ceramic brakes can occasionally feel a bit short of stopping, as they need to be properly hot to function at their best. However, despite this, and the fact there’s no physical link between the pedal and the brake pads, there’s still no lack of feel. 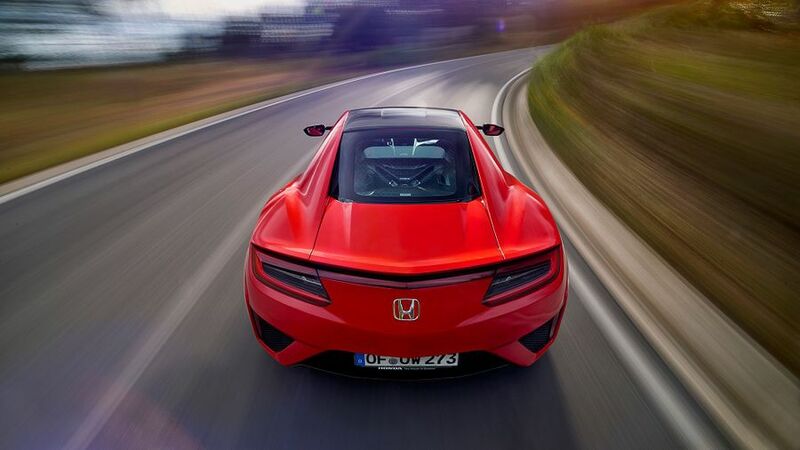 The first thing that strikes you about the NSX is how easy it is to drive quickly. Very quickly. Although no official figures have been released, a sub-three second explosion to 62mph when utilising launch mode is probably about right. This immense acceleration is generated by no less than three electric motors and a twin turbocharged V6 petrol engine, while the driving forces are delivered to the road through all four wheels. With not so much as a hint of tyre yelp, or any sense of mechanical stress – other than a slight rise of the nose and the manically rising digital speedo – it’s difficult to comprehend you are covering the ground with such alarming haste. Some of this feeling of detachment is undoubtedly down to the soundtrack. While the petrol engine burbles and snarls with menace, and a pronounced hiss of turbocharged venom punctuates every gearshift, the soundtrack coming out of the rear pipes still sounds rather muted, especially compared to that of an Audi R8 V10. The NSX may be the ultimate everyday supercar, but there’s nothing commonplace about its asking price, its running costs, or the length of time you’ll have to wait for delivery: the waiting list is currently running at around three years. By the time you’ve chosen a few tasty trinkets, such as ceramic brakes or a carbon fibre exterior trim pack, you can also easily add an extra £20,000 to the price. As with any motoring exotica, fuel, tyres, insurance premiums and servicing will all create a whopping black hole in your bank balance. However, with so few cars being produced, at such a slow pace, and because the demand for capital gains exempt supercars shows no sign of abating, if you did decide to sell your NSX, it could well end up making you a few bob. At this point we’re tempted to say, your guess is as good as ours. Although it’s a highly complex vehicle, unless some irate well-heeled customer creates an online Twitter storm, the chances of anyone ever knowing of any problems with the NSX are remote. What we can say is Honda’s reliability record for its more mundane vehicles and its high-performance superbikes is impeccable, and Honda has a reputation for reliability that is the envy of the motor industry. Look at pretty much any reliability or customer satisfaction survey going, and you can bet Honda is on or near the top of the list. Cars as exotic as the NSX aren’t usually crash tested by Euro NCAP, but Honda claims the NSX delivers ultra-high chassis rigidity, and the use of light materials including aluminium and carbon fibre reduces mass and maximises collision performance. The NSX is also equipped with front and side airbags, and a driver knee airbag. 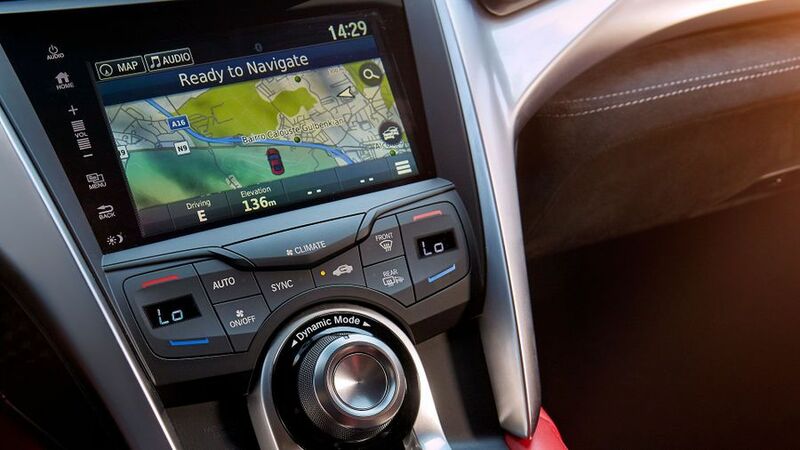 There’s also automatic collision notification, but many safety features you find on a typical family hatchback – like blind-spot monitoring, adaptive cruise control or low speed autonomous braking – aren’t available. Standard equipment is not particularly generous, but does include LED headlights, heated mirrors, adaptive suspension dampers, 19-inch (front) and 20-inch (rear) wheels, keyless ignition and entry, dual-zone climate control, leather and Alcantara upholstery, heated seats, a 7-inch touch-screen, and Apple CarPlay and Android Auto smartphone integration. 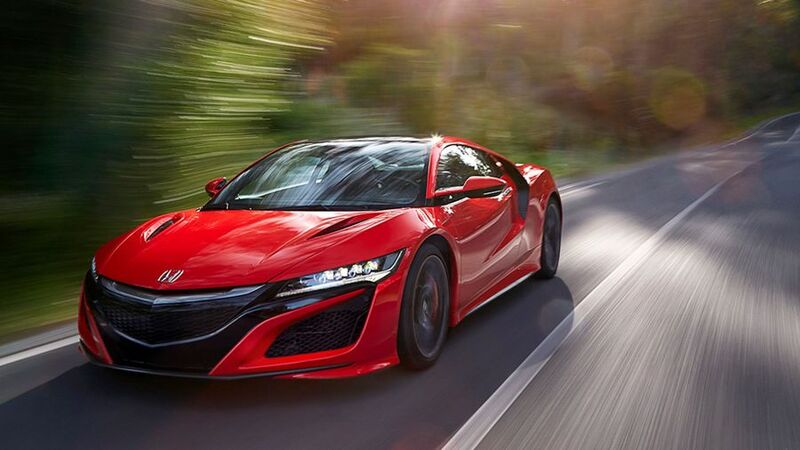 The NSX's options include things like sat-nav, parking sensors, and an upgraded sound system. You can also choose to add powered full leather seats, an Alcantara headliner, carbon-ceramic brakes, upgraded track orientated tyres, metallic paint, and various carbon-fibre bits and pieces for the roof panel, engine cover and rear spoiler. At this sort of money, the NSX is up against the likes of Porsche’s mighty 911 Turbo S, Audi’s ballistic R8 V10, and the simply sensational McLaren 570S. If you’re in market for any of these cars, it’s probably not a case of choosing one over the other. Chances are, if you can afford one of these cars, you can probably afford all three. There are worse problems to have.